On one pole, you have people who hate him because he’s too much of an in-your-face good person, which makes very little sense; at the other pole, you have people who love him because he succeeds at his job while being uniquely unskilled at its traditional requirements, which seems almost as weird. Equally bizarre is the way both groups perceive themselves as the oppressed minority who are fighting against dominant public opinion, although I suppose that has become the way most Americans go through life. Need an example? Take a group conversation at a party: Person A mentions they like the Lord of the Rings movies. Person B pipes up that they actually really didn’t like them. Person C agrees with Person B, and the two bond a bit over finding out they share this unusual opinion. After a minute or two, Person A is getting a little frustrated and is now even a BIGGER fan of the movies. If it stopped there it wouldn’t be a Tebow fallacy, just regular old defensiveness. What kicks it over the edge is when Person A starts claiming “no one ever talks about how good the cinematography was in those movies!” or “no one really appreciates how innovative those were!”. or “No one ever gives geeky stuff any credit!”. They walk away irritated and believing that saying you like the Lord of the Rings movies has been sort of a subversive act, and that general defensiveness is called for. Now of course this is all kind of poppycock. The Lord of the Rings movies are some of the most highly regarded movies of all time, and set records for critical acclaim and box office draw. The viewpoint Person A was defending is the dominant one in nearly every circle except for the one they happened to wander in to that night, yet they’re defensive and feel they need to continue to prove their point. It’s the Tim Tebow Fallacy. We’re terrible at figuring out how widespread opinions are. In my Lord of the Rings example, Person A extrapolated small group dynamics to the general population, likely without even realizing it. Now this is pretty understandable when it happens in person, but it gets really hard to sort through when you’re reading stuff online. Online you could read pages and pages of criticism of even the most well-loved stuff, and come away believing many more people think a certain way than they do. Even if 99.9% of American love something that still leave 325,000 who don’t. If those people have blogs or show up in comments sections, it can leave you with the impression that their opinions are more widely held than they are. And make no mistake, this influences us. It’s why Popular Science shut off their comments section. We feed off each other and headlines The internet being what it is, let’s imagine Person A goes home and vents their frustrations with Person B and C online. What started as an issue at one party no turns in to an anecdote that can be spread. The effect of this should not be underestimated. A few months ago someone sent me this story, about a writer with a large-ish Twitter following who had Tweeted a single picture of a lipstick name “Underage Red” with the caption “Just went shopping for some makeup. How is this a lipstick color?”. The whole story is here, but by the end of it her single Tweet had made it all the way to Time Magazine as proof of a “major controversy” and being cited as an example of “outrage culture”. She was inundated with people calling her out (including the lipstick creator, Kat Von D) for her opinion, all seemingly believing they were fighting the good fight against a dominate narrative. A narrative that was comprised of a single rather reasonable Tweet about a lipstick. I don’t blame those people by the way….I blame the media that creates an “outrage” story out of a single Tweet, then follows up with think pieces about “PC culture” and “oversensitivity”. The point is that in 2016, a single anecdote going viral is really common, but I’m not sure we’ve all adjusted our reactions to account for the whole “wait, how many people actually think this way?” piece. It’s even worse when you consider how often people lie about stuff. Throw in a few fabricated/exaggerated/one sided retellings, and suddenly you can have viral anecdotes that never even happened. From Brewer, M.B. (1991). “The social self: On being the same and different at the same time”. Personality and Social Psychology Bulletin, 17, 475-482. By positioning our arguments against the dominant narrative, we can both defend something we really believe in AND differentiate ourselves from the group. I think that makes this type of fallacy uniquely attractive for many people. Question: I don’t think you’re funny and I’m frustrated that other people do Answer: It’s okay. Try not to be too upset about it. Humor is simply your brain being surprised by an unexpected variation in a pattern that it recognizes. If your brain doesn’t recognize the pattern or the pattern is already too familiar to your brain, you won’t find something humorous. With the internet (and cable news, Facebook, Twitter, etc) we now have the ability to see hundreds or thousands of different opinions in a single week. What we often fail to recognize is that we actually select for most of these….who we follow or friend, webpages we visit etc. Everyone else does too. We are all constructing very individualized patterns of information intake, and it’s hard to know how usual or unusual our own pattern is. Instead of just “those who loved Lord of the Rings movies” and “those who didn’t” there’s also “those who hated it because they are huge book fans”, “those who don’t like any movie with magic in it”, “those who hated it because they hate Elijah Wood”, “those who prefer Meet the Feebles”, “those who didn’t get that whole ring thing”, “those who thought that was the one with the lion”, “those who liked it until they heard all the hype then wished everyone would calm down”, etc etc etc. Point is, we are often selecting for certain opinions, then reacting to the opinions we selected ourselves and taking it out on others who may legitimately never have encountered the opinion we’re talking about. If you combine this with point #3 above, you can see where we end up positioning ourselves against a narrative others may not be hearing. It’s a common mistake for great thinkers. Steve Jobs is widely considered one of the most innovative and intuitive businessmen of all time. His success largely came from his uncanny ability to identify gaps in the tech marketplace that were invisible to everyone else and then fill them better than anyone. What often gets lost in the quick blurbs about him though is how often he misfired. He initially thought Pixar should be a hardware company. He wiffed on multiple computer designs and had a whole confusing company called NeXT…..and he’s still considered one of the best in the world at this. Great thinkers are always trying to find what others are missing, and even the best screw this up pretty frequently. As with many fallacies, it’s important to remember that IQ points offer limited protection. What makes your mind great can also be your downfall. It gets us out of dealing with uncomfortable truths. One of the first brutal call outs I ever got on the internet was a glib and stupid comment I made about the Iraq War. It was back in 2004 or so, and I got in an argument with someone I respected over whether or not we should have gone in. I was against the war, and at some point in the debate I got mad and said that my issue was that George Bush “hadn’t allowed any debate”. I was immediately jumped on and it was pointed out to me in no uncertain terms that I was just flat out making that up. There was endless debate, I just didn’t like the outcome. That stung like hell, but it was true. Regardless of what anyone believes about the Iraq War then or now, we did debate it. It was easier for me to believe that my preferred viewpoint had been systematically squashed than that others had listened to it and not found it compelling. This works the other way too. I’m sure in 2004 I could find someone claiming vociferously that we’d over-debated the Iraq War, based mostly on the fact that they made up their mind early. Most recently I saw this happen with Pokemon Go, where the Facebook statuses talking about how great it was showed up about 30 minutes before the “I’m totally sick of this can we all stop talking about this” statuses showed up. I’m not saying there’s a “right” level of public discourse, but I am saying that it’s hard to judge a “wrong” level without being pretty arbitrary. We all want the game to end when our team’s ahead, but it really just doesn’t work that way. So that’s my grand theory right there. As I hope point #6 showed, I don’t think I’m exempt from this. A huge amount of this blog and my real life political discussion are based on the premise of “not enough people get this important fact I’m about to share”. I get it. I’m guilty. On the other hand, I think in the age of the internet when we can be exposed to so many different viewpoints, we should be careful about how we let the existence of those viewpoints influence our own feelings. If the forcefulness of our arguments is always indexed on what we think the forcefulness of our opposition is, that will leave us progressively more open to infection by the Toxoplasma of Rage. As the opportunities for creating our own “popular narrative” increase, we have to be even more careful that we reality check that at times. Check the numbers in opinion polls. Read media that opposes you. Make friends outside your demographic. Consider criticism. Don’t play for the Jets. You know, all the usual fallacy stuff. Excellent riff on people’s reactions to Tebow though I think it’s probably a better example of ex post facto justification of our decisions. In the excerpt above .. A player for a Division I school and a Heisman Trophy winner is ‘uniquely unqualified’ to be an NFL quarterback? Not just mediocre but ‘unqualified’?Really? As a Vikings fan I found his example of the Broncos-Vikings game interesting because I’d say Ponder came closer to deserving that description from a career perspective, as he quickly became a footnote in Vike’s history after they signed Teddy Bridgewater. 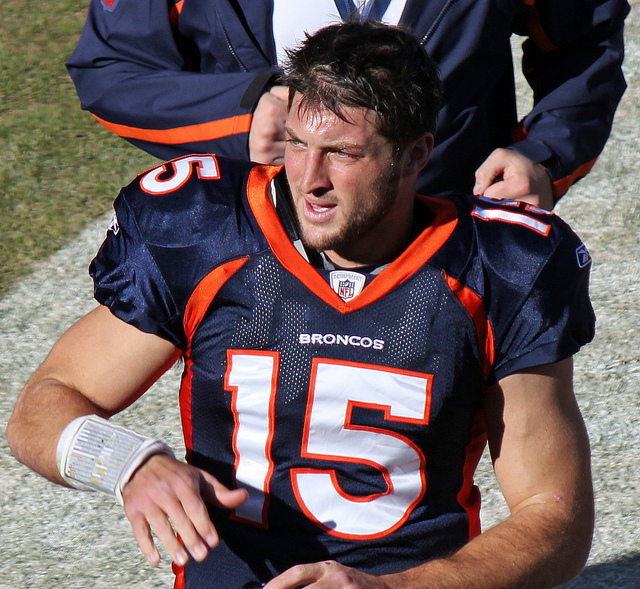 I’d say the Tebow haters were, as Klosterman eventually admits towards the end when he quotes John Elway, struggling with the cognitive dissonance that reality (6-1) didn’t align very well with a decision they made about Tebow’s football abilities not based in any way on his on-field performance. Certainly people tried to make justifications based on football stats, and I’m certainly not saying he was among the greats, but he was capable of performing his duties as assigned in a game plan that lead to Bronco’s victories. That’s what any player is getting paid for, and should be the measure of their effectiveness. I hadn’t considered the ex post facto angle, but that’s definitely a part of it. WRT Tebow especially, you’re right that many people seemed offended he was doing better than they thought he should. While he was winning it was kind of like reality was oppressing them. PLEASE MAKE FACTS MEET MY EXPECTATIONS DAMMIT. I am not taking the Tim Tebow discussion bait on anything. This topic is dear to my heart, because I have a strong tendency to put on the brakes whenever a discussion is running too far in one direction and start pointing out pieces that others might have missed, even when I essentially agree with their essential point. That may have been stronger when I was younger – I may pick my spots more now. I think I have a reflex against exaggerations more than against strong opinions – and people get to the exaggerations pretty quickly, That’s clearly true in this political season. I think Obama is legitimately terrible in many ways, but when people start bringing up the FEMA camps and the contrails I wonder why they need him to be so bad. Same with Trump/Hitler. So on the subject of standing apart I might be on the high but not extreme end of the Bell Curve. I think I am pretty good at identifying what is an outlying opinion that be simply ignored and what is a minority opinion that I fear could gain steam if it weren’t strangled early. Mixed metaphor there, sorry. But I likely also fall for the idea that the placement of an idea gives it the appearance of more popularity than it actually has. Example: waiting at the optometrist’s today I read a comment in Sports Illustrated complaining that some WNBA team had started 13-0 but didn’t get more than a slight mention. She blamed the lack of popularity on the WNBA partly on the lack of coverage SI gives to such things. I figured that since it got printed, SI must get lots of similar letters, or believe there are lots of people who feel the same way, and felt they should give them voice. So I sort of assumed there must be lots of people who think this way. Certainly not a majority, but Enough To Matter, so they deserved refutation. But maybe not. It may be that few people feel this way, but SI and ESPN and other sources treat it as a legitimate minority opinion for other reasons, like not wanting to inadvertently touch off a firestorm, or to get their GF’s off their backs, or to feel good about themselves or whatever. I was talking recently with someone about social acceptance of some group or another (LGBT most likely), and was trying to remind them that no idea or group gets 100% acceptance. I used the analogy of being a working mom…it’s 2016 in America and there are still people who think that’s morally wrong. Not many, but a quick Google search would give me plenty of examples of mean rhetoric. How many people believe this? How often do you encounter them in real life? Do they have any power? Is there a negative outcome we can trace back to this belief/these people or is it their existence that troubles you? I’m not sold on where any of those lines should be set, but I think the questions should at least be considered. It’s way too easy on the internet to seek out criticism of something important to you then be upset that it exists.